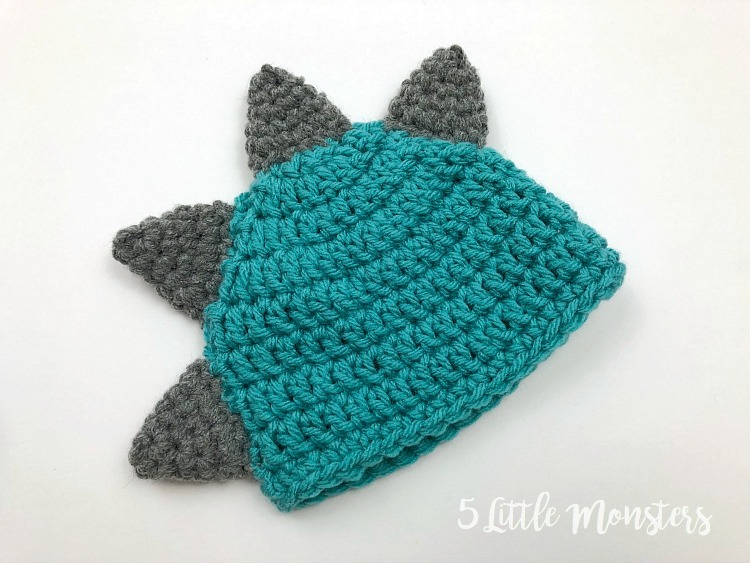 Last week I posted a teddy bear hat that I made by embellishing loom knit hats with crocheted ears and mentioned that it was the first in what was going to be a series of embellishments to add to baby hats. 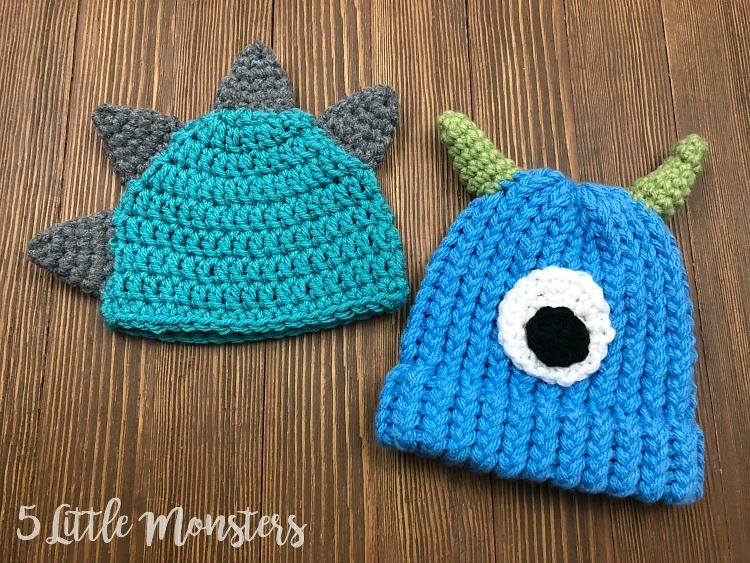 This is the second post in that series, how to turn a basic loom knit or crocheted hat into a monster or dinosaur hat. I started the series in response to requests I received after sharing some little fruit hats that my sister made that were loom knit with crocheted stems and leaves. As a result I first considered it to a "how to embellish loom knit hats" series, but as I worked on the last post I realized that you can add the embellishments to any kind of hat, loom knit, crocheted, or even knit. 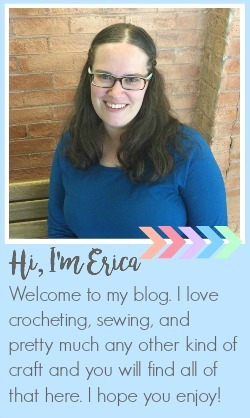 This time I decided to show both a loom knit hat as well as a crocheted version to show that these embellishments can be added to any basic hat to make it extra cute and fun. 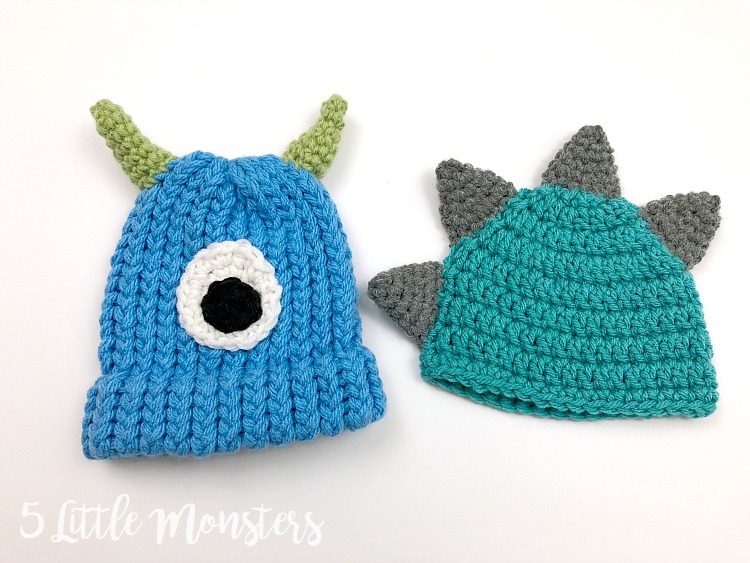 Today I am sharing a dinosaur hat that is made you just adding a few triangular spikes along the center of the hat. I have made a bigger kid version of this hat for my son, I believe he was in kindergarten at the time, and he loved it. I even made some to sell after people saw his hat and I don't usually like to sell finished items. 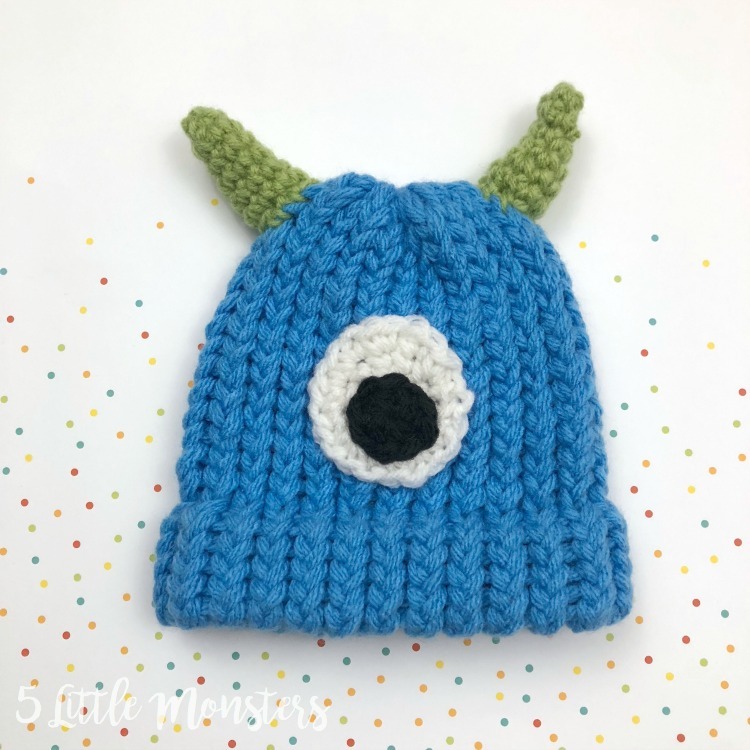 The monster hat has little pointy horns on top and one big eye on the front. 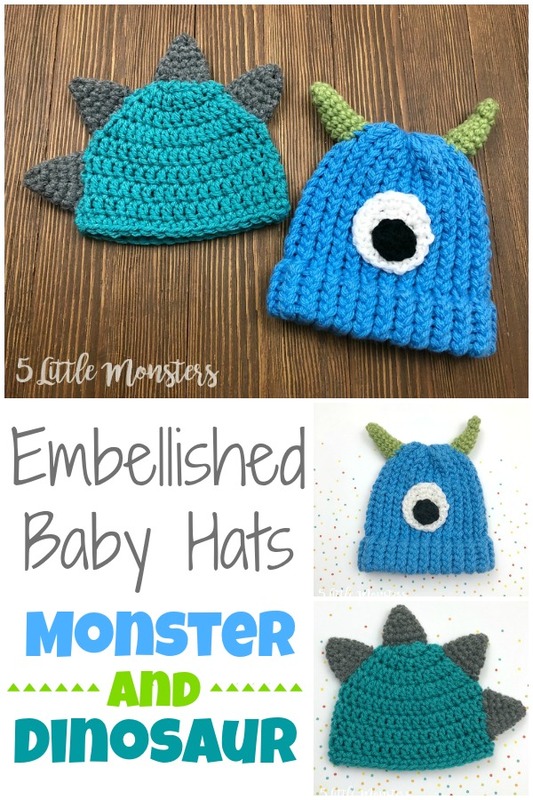 You can mix and match the pieces to create your own monster hat too. You could easily switch it up and make 2 eyesore your little monster. Maybe add 3 dino spikes across the top of the hat with the monster eye(s) or add stripes to the horns. The biggest goal with these posts is to show how easy it is to turn a plain, basic hat into something more. With a few basic shapes (eyes, ears, spikes, leaves, etc.) you can make pretty much anything you want. 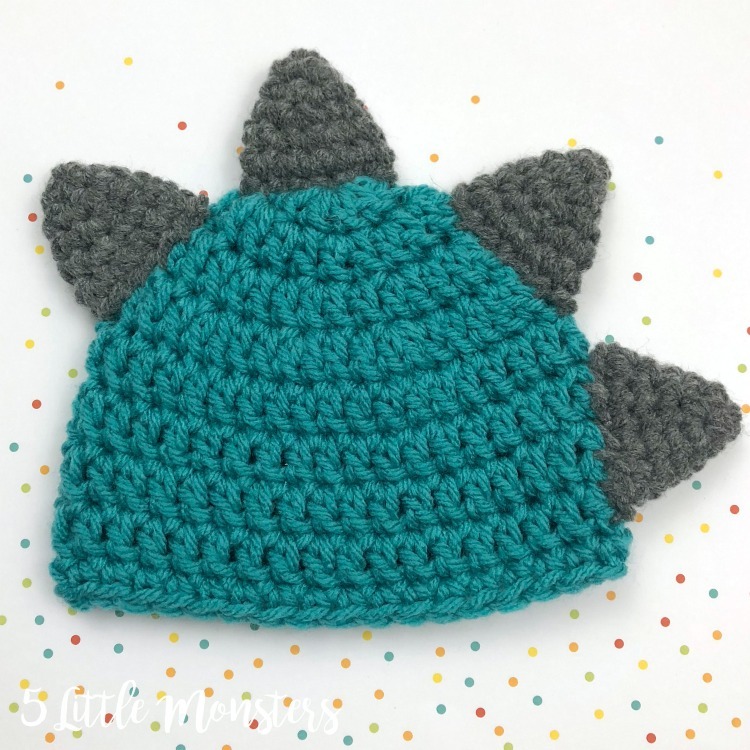 To make the dinosaur hat you will need to start with a basic hat, for this one I used a crocheted hat, newborn size, with this pattern. You will then make the spikes, I made 4, then you will stitch then down the center of the hat. Stitch the spikes along the center of the hat, starting at the back and working your way up over the head, the front of the hat is the side that is left empty without spikes coming all the way down. 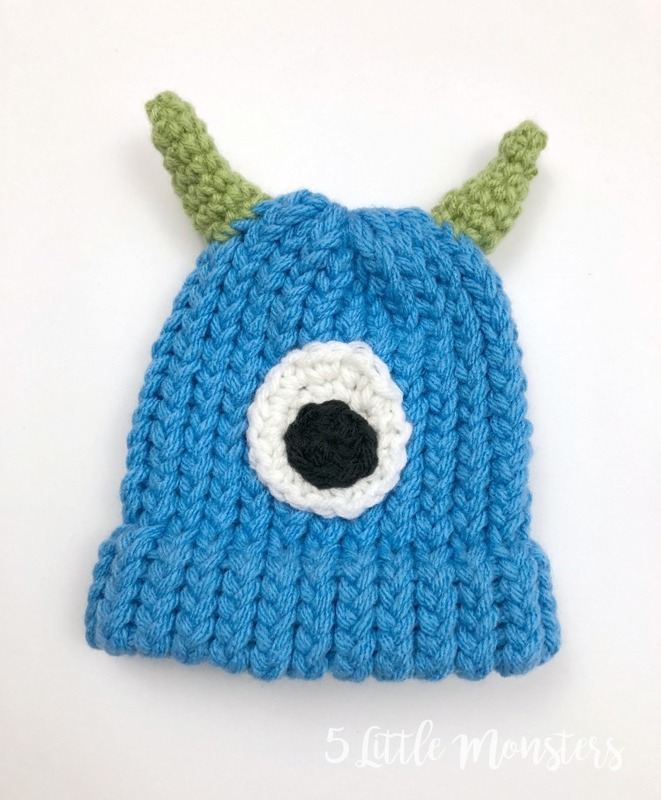 The monster hat is made by adding 2 horns to the top of the hat and an eye or 2 to the front. Stitch the smaller black circle onto the white circle and stitch the eye to the front of the hat. Stitch the horns to the top of the hat.